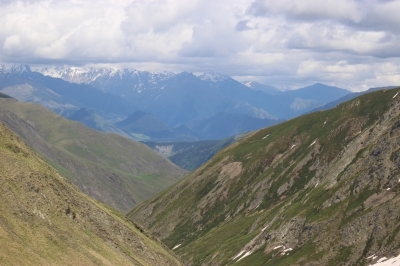 Mta-Tusheti is part of the Tentative list of Georgia in order to qualify for inclusion in the World Heritage List. My expercience of Mta-Tusheti is very limited, having just entered the area for about an hour. While in Georgia, I had rented a 4 wheel-drive car and had one day left. So, I decided to get a glimpse of Mta-Tusheti by driving up to the 2927 meter high Abanos pass, the only access road to the area. This road is extremely rough and difficult to drive (but not impossible as mentionned in several guidebooks). Scenary is spectacular, the road scary, twining on very steep hillside, with very sharp hairpin bends but altogether rather safe and fun. Once on Omalo Pass, I drove down the Omalo valley, having to cross some streams and snow packs. The views are fantastic over high snow-capped mountains peaksand deep valleys. I only had a quick preview however, as a two day trip is really a minimum to visit the area. Driving is really slow (about 4 hours for a mere 72 km), and some area can only be visited on foot or on horse. Mta-Tusheti (probably soon to be resubmitted as The Highland province of Tusheti) is a small historic region in eastern Georgia, located on the northern slopes of the Caucasus range. It is home of numerous rare and endemic animal and vegetative species. It is a popular destination with mountain-trekker. It is inhabited by the Tush, a subgroup of Georgians, with specific traditions. There is ten village, all dotted with defensive towers, and some vernacular architecture of fortress-like residential buildings. It is often compared to Svaneti. Getting to Tusheti is normally done on group tours for a few days, hiking (or horse-rinding) the villages, valleys and mountains of the area. It is not well developped and accomodation are in basic guesthouses. A guide seem to be essential to get around. I will definitely go back there and spend a few days, to get a fuller and better idea of this valuable site.